Instead, here are some healthy alternatives and fun ideas that are just as delicious as chocolate and cuter than candies. Yogurt Dipped Strawberries. These are a great alternative to chocolate-covered strawberries and are super simple to make. Grab some strawberries, dip into any flavor yogurt you like, Greek or regular, and then place on waxed paper and freeze for 30 minutes. If you want a thicker coating, re-dip and then refrigerate for another couple hours. If you can’t let go of the chocolate, sprinkle chocolate sprinkles on before freezing or refrigerating (depending on the number of coats). 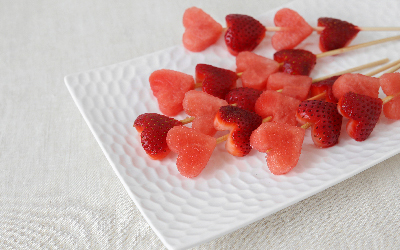 Watermelon and Strawberry Kebabs. Why does food on a stick just taste better? Kebabs don’t have to be just chunks of meat. Instead, alternately string chunks of watermelon, keep pieces at least an inch square, and whole or halved strawberries, depending on size, on skewers. Chocolate-Dipped Clementines. Clementines are those delicious, easily-peelable, tiny orange-like fruits that kids and adults can’t get enough of. To make them extra special for your valentine, dip the peeled segments in melted dark chocolate, a sprinkle of sea salt is optional. Dark chocolate has been proven to improve blood flow and lower blood pressure. It’s also a powerful source of antioxidants. Homemade Strawberry Fruit Roll-Up. Homemade fruit roll-ups are really easy to make. All it takes are fresh strawberries, a little sugar and patience. Process your strawberries until they are as smooth as possible; don’t worry about the seeds, they just make your roll-ups look more homemade. Add enough sugar so the strawberries taste sweet and pour a thin layer onto a parchment-lined baking sheet.Bake in a 170-degree oven for about four hours or until set. Heart Shaped Everything. Take out your heart-shaped cookie cutter and put it to work making anything and everything heart-shaped. The sky is the limit so use your imagination. Try using it on apple slices with yogurt dip, pancakes, sliced potatoes and even PB and J sandwiches. Personal Fruit Messages. Grab a piece of fruit with a peel, like an orange or banana, and write a sweet message to your valentine before packing it in their lunchbox or bag. There’s no prep, cooking or baking required yet it still sends a message of love. Try these options the next time you’re wondering what to gift your valentine with because nothing says “I love you” more than the gift of good health! A visit to your doctor for annual checkups is also important to keep you on the path of good health. If you haven’t made an appointment in a while, schedule one today. We have locations across Siouxland.